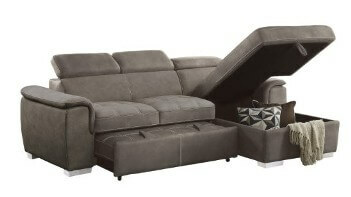 Contemporary sectional features deep seating with adjustable headrests & wide arms. Plush taupe upholstery with contrast stitching accents. Hidden storage compartment in the chaise, and the loveseat folds out to make an almost queen-sized sleeper.